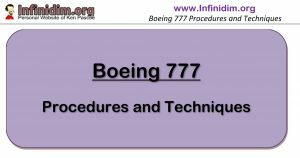 I was asked recently to write for an internal newsletter to provide some Boeing 777 specific information to non-777 pilots on the role of the 777 Autopilot Flight Director System (AFDS) and Autothrottle in the Asiana 214 accident. The following article is based on that contribution. 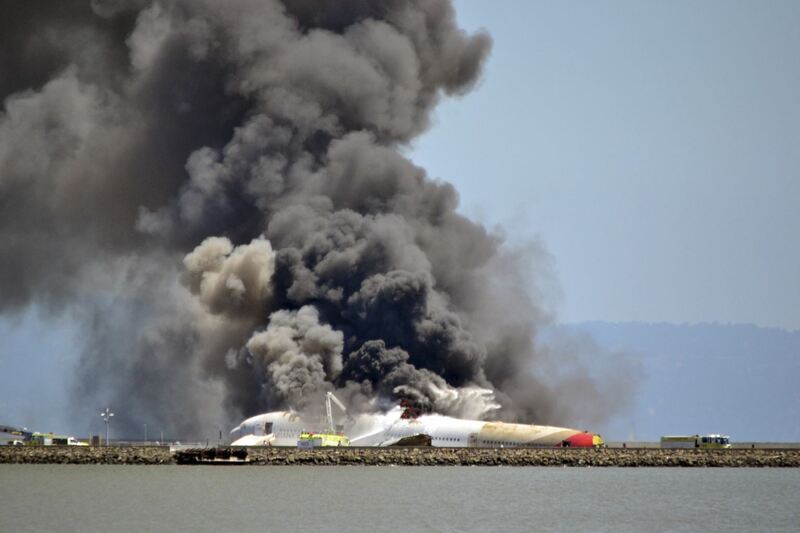 With the publication of the Asiana 214 NTSB Final Report, this article seeks to provide some background to the particular features of the Boeing 777 AFDS that were factors in this tragic accident. Like most accidents, the lessons learned from it are not new to world’s 777 Training/Standards Departments or the pilots flying Boeing 777s – but serve to remind us of the limitations of our aircraft as well as to re-focus the priorities of a number of operators onto re-examining basic AFDS mode awareness and to review the conduct of visual approaches and visual approach procedures in general. Note : This article makes no attempt at accident analysis nor does it delve into procedural, systemic or the human factors elements involved in Asiana 214. A wider viewpoint of the issues associated with modern glass flight decks and the associated automation can be found in the FAA Operational Use of Flight Path Management Systems on September 2013, any update to the previous first look at Automation and glass flight decks of 1996 – this is well worth your time. I also recommend Automation Airmanship : Nine Principles for Operating Glass Cockpit Aircraft. Long Haul Augmented (4 pilots) crew; with 3 pilots on the flight deck for the approach/landing accident. Experienced Captain as Pilot Flying (PF) under transition line training (change of aircraft type); while he had previous Boeing 747-400/Boeing 737 experience; he’d spent the previous 4 years on the Airbus 320 with it’s unique flight control system. Relatively new Training Captain (experienced Line Captain) as Pilot Monitoring (PM) in the First Officer Seat; Support First Officer in the jump seat. The RW28L precision Instrument Approach and Landing System (ILS) was un-serviceable and the crew were prepared and cleared for a Localizer/Visual Approach. The aircraft was high on approach at 3000 ft, with Autopilot engaged and Vertical Speed in use to increase the descent rate. However the descent rate was returned to 1000 fpm at 2200 ft while still above path – just before the Missed Approach Altitude 3000 was set on the Mode Control Panel (MCP) Altitude Selector. At 1500 ft the PF engaged Flight Level Change mode to expedite the descent – but because the MCP selected altitude was set to 3000 – the AFDS instead initiated a climb. 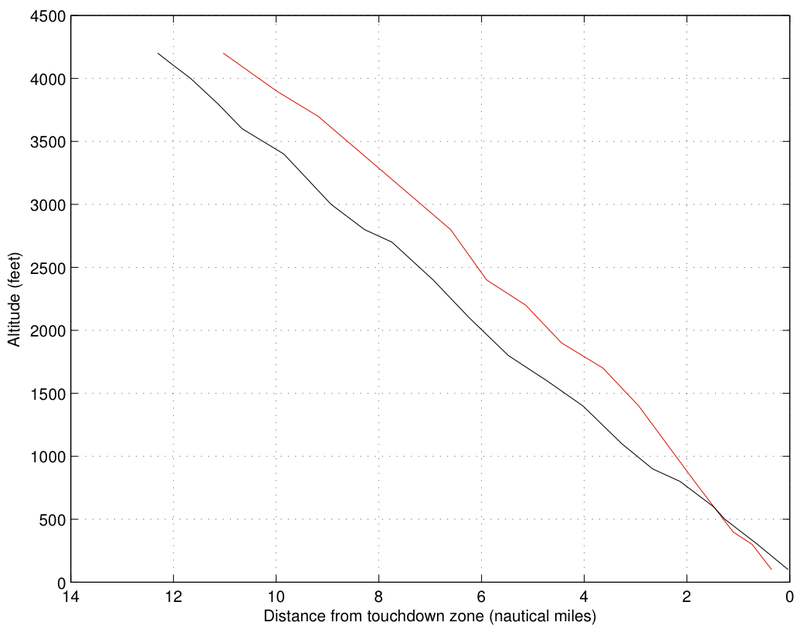 In response to this, the PF disconnected the Autopilot and retarded the Autothrottle to idle which engaged (reverted) the Autothrottle into HOLD mode. Shortly after this the PM turned the Flight Director OFF on the PF side of the MCP only. The PMs flight director remained ON with the Autothrottle in HOLD and the AFDS pitch mode in FLCH SPD. As the aircraft descended through the 3 degree path at about 400 ft on short final, the PF was manually flying, airspeed was correct (but reducing slowly) and the thrust levers were at idle (in HOLD mode) – with the aircraft continuing to descend at greater than 3 degrees. As the aircraft became (very) low on path, the PF raised the nose to return to flight path, even as the airspeed continued to decrease towards the stick shaker (low speed warning system). The Precision Approach Path Indicator lights (PAPIs) were operational on RW28L throughout and would have indicated low from about 300 ft onwards. 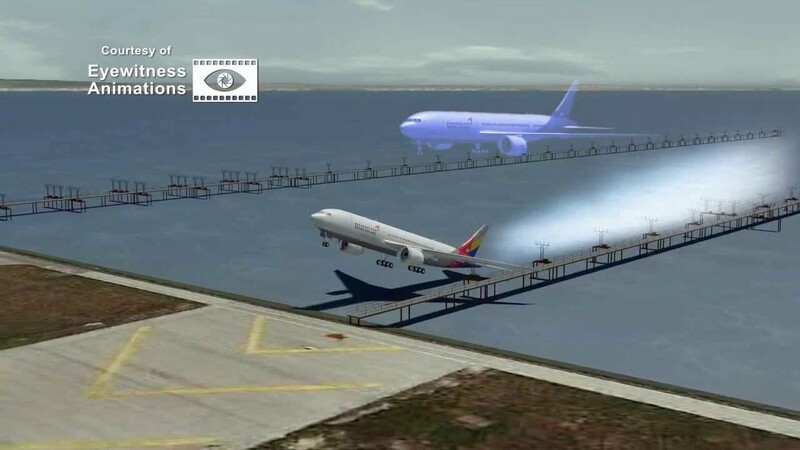 Comprehension of the aircraft state and the need for thrust/go-around came too late in respect of the energy available in the aircraft to effect a recovery and the aircraft impacted the sea wall short of RW28L. Like most aircraft – the 777 Autothrottle typically operates in either a speed driven mode (SPD) or a fixed thrust mode (THR, THR REF, IDLE). When the Autothrottle is commanding SPD, the servos can be overridden through the Thrust Levers at any time with almost no effort – although as soon as the Thrust Levers are released the servos usually return the Thrust Levers (and therefore the thrust) back to commanding a thrust to achieve the selected speed. It’s recommended practice that instead of overriding the servos, the proper course of action is to disconnect the Autothrottle and take full manual control through the Thrust Levers instead. 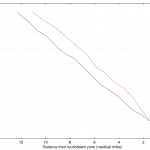 If you try and override the Autothrottle while it’s commanding THR (Thrust) – you get a different behavior … read on. The Autothrottle HOLD mode engages for a Flight Level Change descent when the required thrust setting has been achieved (whether idle or something above idle), and remains in HOLD until the altitude change is complete. In HOLD mode the Autothrottle will not resist pilot changes through the Thrust Levers, and the pilot can vary the thrust to change the rate of descent – this technique can be used to produce a constant descent arrival with better speed control that is available with Vertical Speed. For the 777 (and I presume most aircraft) – Flight Level Change is not an appropriate mode for final approach. It offers almost no path protection – and only then if the current safety altitude is set into the MCP altitude selector. There have been a few notable occurrences of inappropriate use of Flight Level Change on approach – including the incident into Melbourne Airport in 2007 which resulted in a GPWS activation on (not so) short final. For a visual approach, when the aircraft is to be flown manually without relevant/useful AFDS lateral/pitch modes – Boeing procedure is to cycle both Flight Directors OFF; and then set the PM Flight Director (only) back to ON. It’s crucial to achieve a point during this procedure where both FDs are OFF. When the Flight Director system is selected OFF with Autothrottle still engaged – irrespective of what modes were active prior to this – the Autothrottle engages in SPD mode. This means that during any subsequent maneuvering – Climb, Level Flight, Descent – the Autothrottle will protect MCP selected airspeed as best it can. This was not achieved during Asiana 214’s approach, even though the PFs Flight Director was switched OFF on the approach. This accident therefore begs the question as to how a modern airliner can find itself placed in this situation. Surely there are layers of speed protection? First and foremost, for Autothrottle based speed protection – the Autothrottle arm switches (A/T ARM) must be ON. The 777 Autothrottle can be disconnected at any time using the Thrust Lever Autothrottle Disconnect Switches – but the system remains armed and can be re-engaged through an AFDS mode (such as Flight Level Change ) or by a speed related event such as a Low or High speed exceedance (amongst others). But when the A/T ARM switches are OFF – the system will not activate under any circumstances. These switches are almost never turned off (engine malfunctions being the primary exception) – and they remained ON (Armed) during the Asiana 214 accident. With the Autopilot Engaged – if the Autopilot is commanding speed on elevators (such as in Flight Level Change), the AFDS will not allow the aircraft to fly at a speed below Minimum Manoeuvre Speed no matter what the PF (through the MCP) or the FMC specifies. If however the AFDS configuration is such that the Autothrottle is responsible for speed control but disabled; and the AFDS pitch mode is not airspeed focused (say level flight in ALT, A/T ARM switches OFF, Thrust Levers Idle) – then airspeed will reduce through the manoeuvre margin towards the stall speed. As the stick shaker activates, the AFDS Pitch mode will fail (ALT), and Autopilot will pitch the aircraft down to maintain a descending speed just above the stick shaker. This only occurs if the Autopilot is engaged. Note that anytime the airspeed approaches approximately halfway between Minimum Manoeuvring (top of the amber band) and Stick Shaker activation speed (top of the first red dot) – an EICAS Caution Message (including Caution Light / Beeper) activates with the message AIRSPEED LOW even as the airspeed box turning amber/bold. 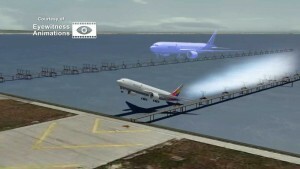 Asiana 214 experienced these indications at about 120 ft AGL. Whether manual flight or on autopilot – as long as they’re armed – the Autothrottles will engage in SPD mode shortly after AIRSPEED LOW and increase thrust towards the selected MCP speed (or minimum manoeuvring speed) – but only if speed is not being commanded by the active vertical AFDS mode. Or to put it another way – the Autothrottle speed protection system won’t activate and advance thrust to maintain speed, if according to the AFDS the elevators are supposed to being guarding speed as well – such as in Flight Level Change. This is the crux of the shortcoming (if I can call it that) of the Autothrottle speed protection system, and the Automation pitfall that did not allow Autothrottle speed protection to activate for Asiana 214. Because the PF had overridden the Autothrottle in Flight Level Change and reverted the Autothrottle into HOLD mode; Because the PM had failed to cycle both Flight Directors OFF and force the Autothrottle into SPD mode; this Asiana 777 was established in one of the few mode combinations where no active AFDS/Autothrottle speed protection was available. The combination of high on profile becoming low on profile very close to the ground only served to place this aircraft and crew in a situation where when they finally did react – it was too late to recover. 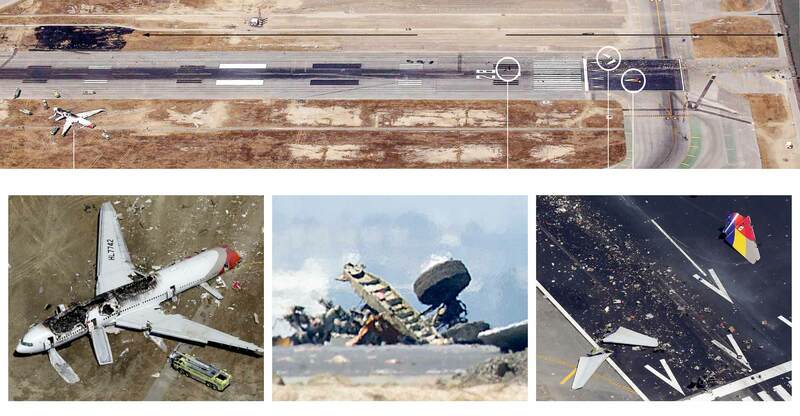 Whether or not you fly a 777 or a Boeing, the Asiana accident contains some fundamental failures that prevail after 20 years of glass/automation flight operations. None of our aircraft are perfect – what are the automation pitfalls on your flight deck – and how can you cover them off to maintain safe flight operations?